Food Trucks A Go Go is hosting a Beatles Brunch on Sunday, Jan. 10 at Skypark in Scotts Valley. It’s the latest installment for the fun monthly food truck series that LaLi Kates of Aunt LaLi’s Mobile Cafe launched in September. Save the date for February’s event—it’s going to be Sunday brunch on Feb. 21 at Skypark. Details will be announced soon. On Sunday, Jan. 10, brunch will be served from 11 a.m. to 1:30 p.m. Food vendors include Aunt LaLi’s Mobile Café, Ate3One, G’s Tacos, and India Gourmet. In case of rain, the event will be canceled and rescheduled. When asked what her inspiration was for creating this month’s new theme, Aunt LaLi replied, “I wanted to create a twist (and shout) for this month’s Go Go Brunch and pairing Beatles music with delicious brunch items seemed like a good fit!” She says that the food vendors are excited and are creating unique items for Sunday. Want a preview? How about cold poached salmon with champagne dill sauce, cucumber, local mixed greens and a buttermilk biscuit; a Huevos Rancheros sandwich; breakfast burritos; a bacon-eggs-pancake combo; samosa sliders; a large selection of naan (garlic, onion, and more) served with garbanzo beans and chutney; chai tea, and mango lassis. Aunt LaLi’s will be selling espresso drinks, affogatos, and acai cups (see photo above). 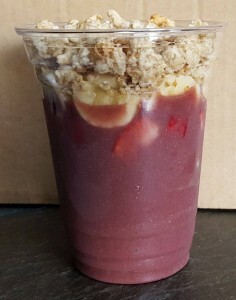 Aunt LaLi says these cups contain strawberries and bananas mixed with acai (from delicious Brazilian Amazon fruits packed with powerful antioxidants and healthy omegas), then topped with strawberries, bananas and granola. There will be lots of seating available at picnic tables throughout Skypark. Attendees can enjoy Beatles music while they dine. LaLi says the playlist with “classics” will include Loaf Me Do, Lucy in the Fries with Diamonds, I Wanna Hold Your Ham, Lettuce Be, and Ate Days A Week. Popular downtown restaurant Assembly is launching weekend brunch service beginning Saturday, June 28. 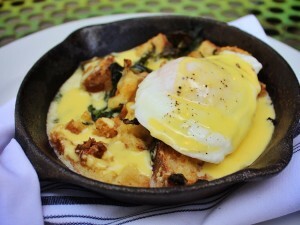 The restaurant will open at 9am and, according to co-owner Zach Davis, “feature a menu of seasonally inspired bunch favorites including house baked pastries and breads.” Choices include savory bread pudding with broccoli, Gruyère, hollandaise and a poached egg; see photo above. Can’t wait to try the newest creations from Chef Carlo Espinas! And there’s more: To celebrate the new brunch menu, this weekend Assembly is featuring guest Verve Coffee Roasters baristas crafting complimentary Verve espresso drinks for diners. Also on June 28, it’s the 5th annual Hop N’ Barley beer and bbq festival. Most events are on Saturday at Sky Park in Scotts Valley, but this year the festival has expanded from one day to two. There are approximately 60 breweries participating, and there will be live music. Saturday is the main event with beer and barbecue, with gates opening at 10 a.m. and beer starting at noon. The gates close at 5 p.m.
On Sunday, there is a morning disc golf tournament at DeLaveaga and an afternoon craft and home brew competition. 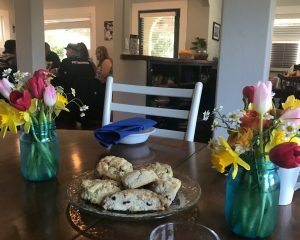 Tickets range from $25-80, but it’s free for non-beer-drinkers including kids – event organizers emphasize that “kids and dogs are welcome.” The Hop N’ Barley beer and bbq festival benefits non-profit Community Housing Land Trust of Santa Cruz County.